Hey my dear fashionistas! How are you? I’m always here to inspire you and awaken your creativity! For today I have made you an amazing post that is called “Fancy Ways to Style Grey This Season”. The outfits that I have selected will take your breath away and will leave you speechless. Let’s check them out and draw some inspiration! Enjoy and have fun! 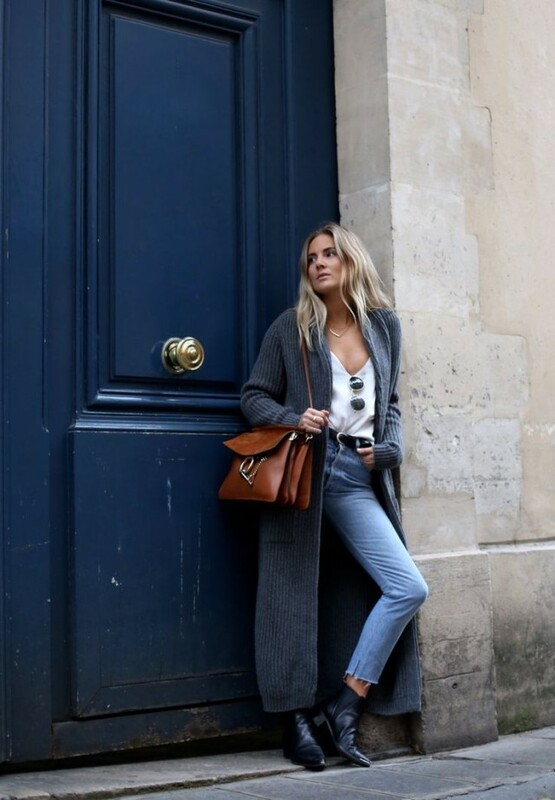 Grey is one of the most worn color in fall and the easiest way to follow that trend is to update your outfit with a grey coat. This color goes great with nearly every color, from white and black, to pink, mint and yellow. If you were searching for a classy, yet stylish and chic combination that you can wear everywhere, then the outfit below is just for you. The shirt and the coat give a classy look to the outfit, while the ripped jeans, stylish and sophisticated. Scarves and warm coats are fall-winter essentials. 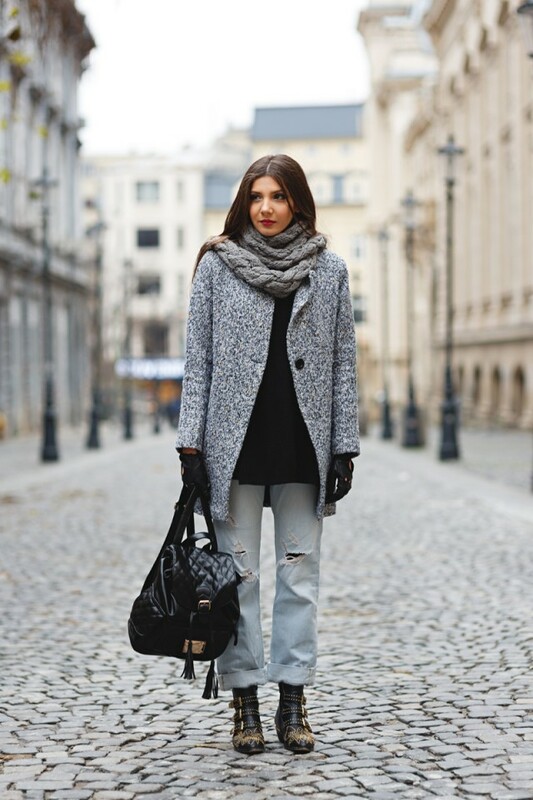 An over-sized grey scarf will perfectly fit to your grey coat. You can wear the casual combination below every day and everywhere. If you are working in a relaxed atmosphere, where there isn’t a dress code, you can wear it to work too. I really like the below the knee coats. What about you? You can style grey below the knee coat with black classy pants and striped blouse. Like the combination above, you can wear this combination to work too. This is the last outfit from this collection that features grey coat and I need to recognize that it’s my favorite. The fedora hat and the coat make the outfit chic and stylish, while the white shirt, jeans and boots, make it classy and elegant. If you were looking for chic street style combination, then you should definitely see the outfit below. I really like it because it looks very comfortable and warm. The skirt makes the outfit fancy and if the outfit was with jeans, rather than skirt, it would looked very casual. Knitted dresses are my favorite for fall-winter and the dress below inspired me to buy a grey one. The dress below is very short to wear it to work or to college, but it looks very stylish and cute for every other event. You can style it with a black, maroon or grey coat. Classy and elegant combination for work and any other formal event! I really like how the pieces are matched! The shoes and the hat give a special touch to the outfit. Who said that you can’t wear mint in fall? The combination below is perfect for everywhere! Take a look at your wardrobe you may have some summer pieces that you can wear in fall, who knows. The coat can be styled with other pastel colors. Cardigans are very trendy and stylish this season. If you don’t know which color to choose, I recommend you to go with grey, as you can style it with nearly everything. This warm and casual street combination will make you look taller and slimmer. I should not forget that you should make the sweaters your best friends this season! They will keep you warm and cozy in the freezing days. You can match them with skirts and jeans, which means that you can make versatile combinations with just one sweater. Grey goes great with everything, so hurry up and update your wardrobe with a grey sweater. If you were searching for a unique outfit that you can wear everywhere, then the combo below is just for you. The colors perfectly match to each other. The scarf makes the outfit more interesting and stylish. Would you dare to wear the outfit below? I find it very chic and unusual, because the pink color is really bold and the other outfit is very simple. I would only change the boots, because I don’t really like them. Grey goes great with baby pink. The outfit below is just perfect for every occasion and I really like it! Do you like these outfits? Which one is your favorite? You can share your opinion in a comment below. Thank you for reading! Enjoy in the rest of your day and don’t forget to stay up to date with the content of Fashion Diva Design!